Last year, Bush trumpeted his healthcare reforms--high deductible health plans paired with a health savings account--as the future of American healthcare: "It means you're in charge of your health care decisions, not a, you know, somebody far away in an office complex that you'll never visit." 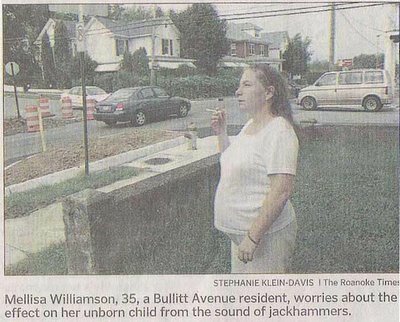 This newspaper clipping, of a pregnant smoker worried about the effects of noise on her fetus, prompts a thought: is that such a good idea? Look closely at the photo if you're not getting it.